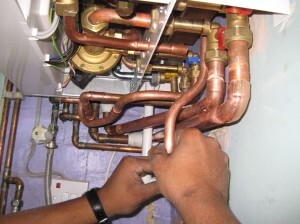 Maintenance: pipework, appliances and flues must be maintained in a safe condition. Gas appliances should be serviced in accordance with the manufacturer’s instructions. If these are not available it is recommended that they are serviced annually unless advised otherwise by a Gas Safe registered engineer. Gas safety checks: a 12 monthly gas safety check must be carried out on every gas appliance/flue. A gas safety check will make sure gas fittings and appliances are safe to use. Record: a record of the annual gas safety check must be provided to your tenant within 28 days of the check being completed or to new tenants before they move in. 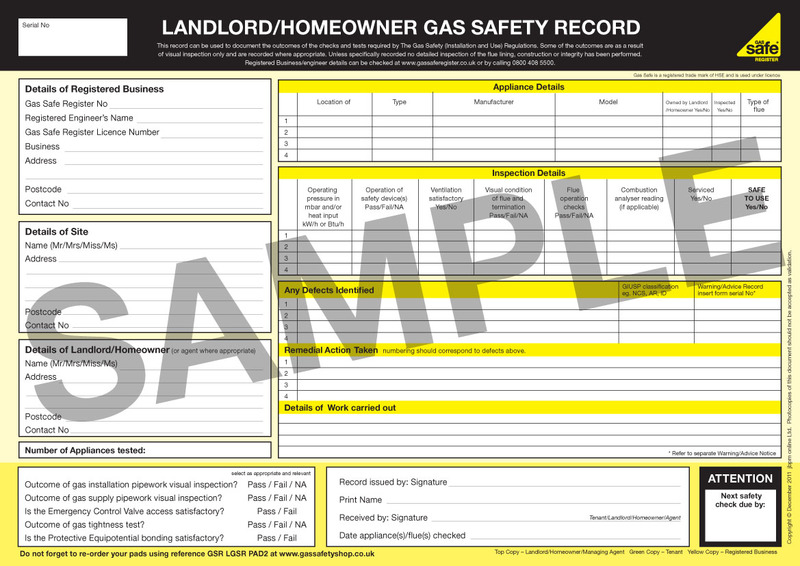 Landlords must keep copies of the gas safety record for two years. 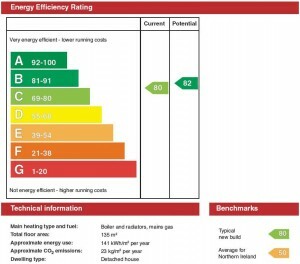 If a tenant has their own gas appliance that you have not provided, then you are responsible for the maintenance of the gas pipework but not for the actual appliance. You should also make sure your tenants know where to turn off the gas and what to do in the event of a gas emergency. What if my tenant won’t allow me access to the property for Gas certification ? The contract you draw up with the tenant should allow you access for any maintenance or safety check work to be carried out. You have to take ‘all reasonable steps’ to ensure this work is carried out, and this may involve giving written notice to a tenant requesting access, and explaining the reason. Keep a record of any action, in case a tenant refuses access and you have to demonstrate what steps have been taken. What if I’m only renting my property for a short period of time? Even if a property is only rented for a short period of time, perhaps only a week as a holiday home, you are still a landlord and have specific duties for gas safety. What are my duties as a letting/ management agent in relation to gas safety or Gas certification? Landlords who use agents to manage properties need to ensure that the management contract clearly specifies who is responsible for carrying out the maintenance and safety check duties, and keeping associated records. If the contract specifies that the agent has responsibility then the same duties under the Gas Safety (Installation and Use) Regulations 1998 that apply to a landlord apply to you. In this situation an agent must arrange maintenance by a Gas Safe registered engineer for all pipework, appliances and flues, which the landlord owns and provides for the tenants use. You must also arrange for an annual gas safety check to be carried out every 12 months by a Gas Safe registered engineer. You must keep a record of the safety check for 2 years and issue a copy to each existing tenant within 28 days of the check being completed and issue a copy to any new tenants before they move in. What checks should be done between tenancies? You must visually check the property to see if the departing tenant has either removed appliances unsafely, or alternatively left behind their own appliance, which should either be removed or checked for safety by a Gas Safe registered engineer . The opportunity should be taken to clarify appliance ownership prior to renting the property again. If you suspect that an appliance could have been tampered with, or there is the possibility of vandalism while a property remains empty, then HSE recommends you arrange for another gas safety check to be completed by a Gas Safe registered engineer before giving access to new tenants. Before you re-let the property you need to ensure that all appliances are safe and have an up to date landlord’s gas safety record (a copy of which needs to be given to the new tenant); it is also good practice to arrange for the pipework to be inspected and tested for soundness. Checking all safety devices are working properly and shutting the appliance off if a fault occurs. If a Gas Safe registered engineer visits you to safety check your appliances, it is in the interests of your safety to let them into the property. Always ask to see their Gas Safe Register ID card before letting them in. 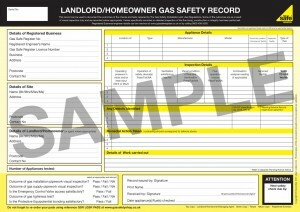 Visit: www.gassaferegister.co.uk for for information.